Blake Crouch is brilliant. You already know this, by virtue of your reading experience with DESERT PLACES, SNOWBOUND, ABANDON, or a half-dozen other books, short story collections and collaborative works that I could name but really shouldn’t have to. Or, you know this because you have been told by a friend, in the same manner in which I did just now. Such quality on Crouch’s part is one reason why you should read WAYWARD, his latest novel and the second installment in the Wayward Pines series. The first, PINES, gave us a strong inkling as to what was going to happen, but with WAYWARD, we’re witnessing the establishment of a phenomenon here. Seriously. In PINES, Crouch discussed the genesis of the series, giving strong credit to “Twin Peaks” (the television series, not the restaurant chain) and to David Lynch for inspiration. Fair enough. But the Wayward Pines series goes beyond that. I thought of “The Prisoner” and a couple of other television shows as I read PINES and the newly published WAYWARD, but in the end this series comprises a league of its own. So what is it about? That’s a tough one to answer because I hate spoilers, so I have a bit of a problem describing the book to you without giving away what happened before or what occurs during it. But let me give it a shot. "WAYWARD has something for everyone. There is a murder mystery, lots of action, and a science fiction premise that should have fanboys and girls at every con chanting 'Blake! Blake! Blake!'" 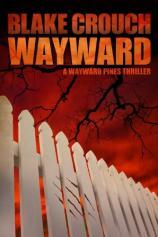 Like PINES, WAYWARD takes place in the idyllic and isolated --- and I do mean isolated --- town of Wayward Pines, Idaho. In PINES, a Secret Service agent named Ethan Burke arrives in Wayward Pines in search of two other agents who went missing there approximately one month previously. Within a heartbeat of his arrival, he is involved in a near-fatal accident. When he regains consciousness in a local hospital, all his personal belongings are missing, and he slowly discovers that he cannot leave the town, which is cut off from the rest of the world. Burke has no idea how cut off he is from everything else, though by the end of PINES, he knows. He has also become, through a series of nasty and very violent and bloody events, the town sheriff, through the machinations of David Pilcher, the power behind the town. WAYWARD finds the newly installed Sheriff Burke as not entirely comfortable with his new position, let alone the town, where everyone is closely monitored visually and audibly. There isn’t a lot for a sheriff, or really anyone, to do in town. Remember in kindergarten when you used to play storekeeper or builder or teacher or whatever? Life is a lot like that in Wayward Pines, where everyone just kind of goes through the motions, day by day, unless or until someone tries to leave. Then things get interesting --- in a very violent way --- and the sheriff is in charge of that, too. Burke hasn’t been on the job long when he stumbles upon the mutilated body of a young woman who is much more than she appeared to be. Pilcher, for reasons that are soon revealed, takes a particular interest in Burke’s investigation into the murder, and attempts to steer Burke in a certain direction for reasons of his own. Burke plays along, but he has his own agenda, one that unfolds with excruciating suspense and will have you screaming, “What the heck is he doing? !” By the end, it becomes clear; it is also clear that Burke hasn’t thought things entirely through, setting it all up for the next volume in the series. WAYWARD has something for everyone. There is a murder mystery, lots of action, and a science fiction premise that should have fanboys and girls at every con chanting “Blake! Blake! Blake!” This series is so good, vivid and wonderfully told that as the word spreads and its fame grows, its fans will take on a life unto themselves. There is so much that Crouch can, and probably will, explore here that I can see the series running for as long as he wants to write it. It has been optioned for network television by one of the good networks that should treat it like the gold it is. Between that, PINES and WAYWARD, and future volumes in the series, we may have a large mass of fans entering the cultural consciousness. What would we call them? Piners? Whatever the term, sign me up as a charter member.